Patients with higher than average risk factors for intra and post operative complications are considered candidates for possible endovascular aneurysm repair. 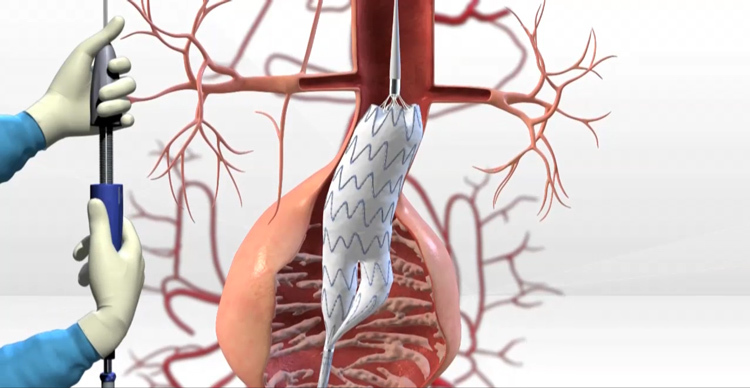 In this technique, a device is inserted into the aorta through the groin. The femoral arteries are either accessed with a puncture or through incisions in the groin. The device is advanced upstream into the aorta under x-ray guidance. The “stent graft” is then deployed or released in the aorta to create strong channel for the blood to flow through taking the pressure of the weakened aortic wall. This approach places less strain on the heart and lungs thus lowering the risk of complications. However, the procedure can only be executed if careful and precise analysis and measurement of critical dimensions of the aneurysm are carried out in advance and if the anatomy is suitable. If there are no good landing zones (areas where the blood vessel walls are parallel) then the graft will not seal properly and the procedure will fail. If the aneurysm anatomy is appropriate then the stent graft can result in lower risks, shorter hospital stay and quicker recovery. One other aspect of EVAR is that the patient should have a CT scan of the Aorta every 6 months to ensure the repair is stable. This is required due to the small possibility of the seal failing and the graft no longer providing protection. Approximately 10% of patients will have some persistent flow in the aneurysm sac. If this persists over a year and particularly if the aneurysm enlarges, further interventions to eliminate the leak may need to be attempted (usually through the groin). In approximately 1% of cases the graft may fail completely in the long term and require a complete open operation to deal with the situation. The preparation for surgery is identical to open surgery in case there is a need to convert to the open procedure although this is a very rare event. Length of stay in the absence of any complications varies between 1-3 days based on type of incision and the patient’s overall health. Follow up in the office is necessary at 4-6 weeks postoperatively and as mentioned CT scan should be arranged every 6 months. Please see section on post operative guidelines for EVAR and the video available on this website. Are you scheduled for a surgery or other invasive procedure? Be sure to fill out the informed consent form.